Our tips for growing blueberries in your garden will show you just how simple it can be to have your own supply of sweet, fresh blueberries! 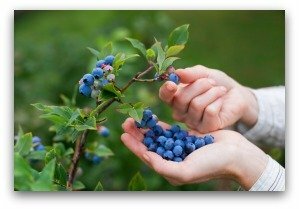 Learn how to plant, grow, care for and harvest blueberries in your backyard for best fresh blueberry results! Even for gardeners who lack a lot of gardening space, planting blueberries can be successfully achieved for years of enjoyment! The shrubs which grow to about five or six feet high make an attractive hedge, a background for vegetables, or a boundary between properties. Two plants each of several of the most popular varieties should provide sufficient fresh berries with a surplus for freezing and preserving. A mixture of varieties, typically two of each variety is required for pollination. 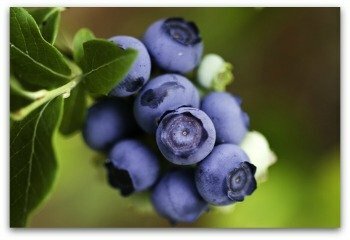 By growing blueberry varieties that are early, middle, and late harvest types, a harvest of berries from early to midsummer can be expected! The best berries are produced from plants exposed to full sun. 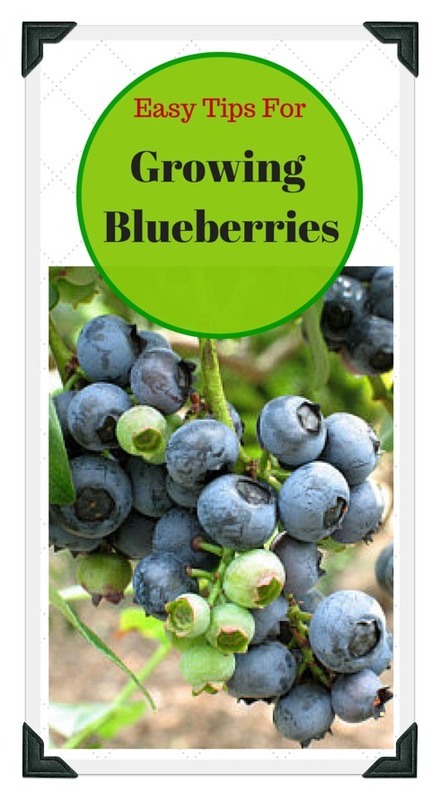 Although, fairly good harvests can be gathered if blueberry bushes are grown in half shade. The soil should be acid around pH 5 and rich in compost. You can hardly overdo the organic matter for growing blueberries. Peat moss is a good source of organics and should be mixed in generously into the planting holes. 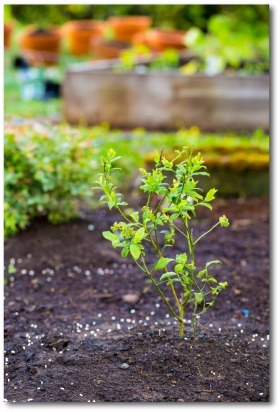 If your soil grows rhododendrons, azaleas, camellias, and other plants that prefer acid soils, you will have no trouble growing blueberries. Plant the bushes in early spring or fall of the year. Set the plants about 6 to 8 feet apart. 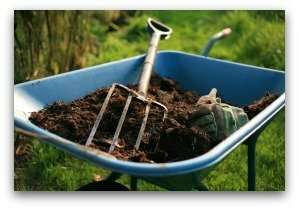 Then apply thick mulch, from 3 to 6 inches deep, of hemlock sawdust, wood chips, leaf mold, or compost. A mixture of all the above can be used. 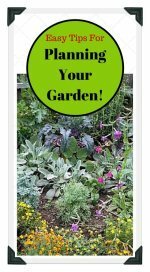 Maintain the mulch from year to year, adding more if needed. In spring, apply a complete or organic fertilizer such as cottonseed meal at a rate of about one ounce of fertilizer per plant for each year of age up to eight years old. For example, if the plants are three years old, apply three ounces of fertilizer. 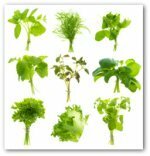 Two-year old plants are typically shipped from nurseries, so unless specified that the plants are one year old, supply two ounces of fertilizer the first year. Usually a second application of fertilizer is applied about the middle of June, at a rate of ½ pound for a plant that is over three years old. 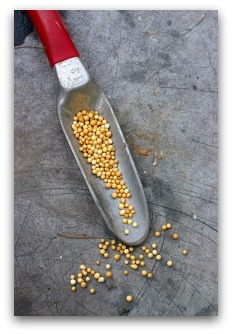 When sawdust is used as the mulch, twice as much fertilizer should be applied. Use 1 ½ times as much as directed above when you are using mulch made of leaves or wood chips. The pests you have to worry the most about when growing blueberries are the birds. They can decimate the crop, of given free rein. Many birds just seem to love blueberries. Light weight netting is available to throw over the bushes to ensure the luscious berries are saved for your family. The best way to cover blueberry bushes for protection from the birds thieving all your delicious berries is to use black plastic mesh. You can purchase these protective covers at local garden centers and they will last for years. However, I have seen robins hop from the ground, and climb up inside the netting to try and sneak a few blueberries anyway! 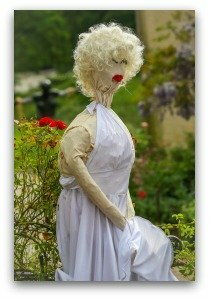 Use a Scarecrow to Keep Away Garden Pests! Some growers also use shiny Mylar streamers, or a balloon-type scare-devices with an eye in the center that is supposed to help scare the birds away. "Scare Birds", designed to look like predator birds, can also be an effective deterrent to garden pests. Scarecrows can work for a while also, but birds seem to quickly realize what is a real threat, and what is not! 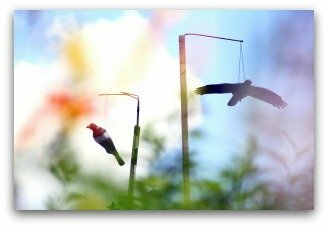 These types of devices can be helpful, but be sure to move them around frequently, as the birds become will become accustomed rather quickly if the devices aren't moved or changed. Cannons, hawks, falcons, and loud music have also been tried by a few desperate gardeners! Hopefully you won't have to resort to such tactics! Pick only ripe berries because partially ripened ones are sour-tasting. Blueberries do not become sweeter when they are picked from the bushes but they do become softer. 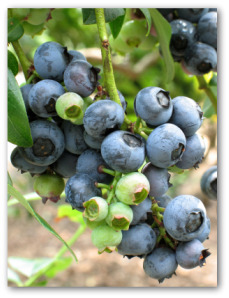 To know the time is right, after the blueberries show full color, wait about a week before harvesting. On the other hand, berries on the plant never ripen all at once, so frequent picking is necessary. Enjoy eating your fresh blueberries, and don't forget to try your hand at making blueberry pie. 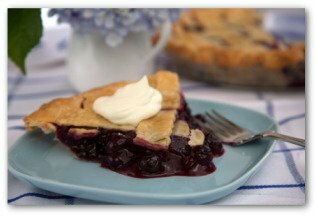 To find our favorite blueberry pie recipe, click on the link below. It's a treat you won't soon forget!